While we were grocery shopping last weekend, I saw that Whole Foods had red bananas at a pretty decent price, so I decided to pick up a few to continue my rum sauce experiments. I know that they take well to heat (until very recently, I actually thought they had to be cooked in order to avoid a stomach ache), and I have a fondness for unusual fruit. They’ve been sitting on the counter tempting me for the last few days, so I finally decided to try again tonight with the caramel sauce. Warm this until it is all dissolved and fairly homogeneous, and add four red bananas, sliced lengthwise (I find it easiest to do this with the skins still on). Place the bananas with the cut side down, and cook them, basting occasionally with the liquid (but not flipping them), until the sugars have slightly caramelized. This should take 10-15 minutes, and you should see the bubble pattern of the boiling liquid change, especially around the edge of the frying pan. The bananas will be quite soft with a bit of crunch on the bottom, which should have some extra caramelization. When they’re done, remove them from the heat to cool for a few minutes, and then serve them with a large scoop of ice cream (I’d recommend vanilla or coconut). I always see the red bananas and never get them as I don’t know what to do with them. This is a great dessert – thanks for sharing this recipe! 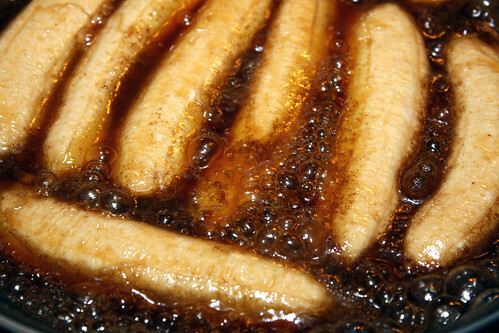 We just had a Bananas Foster at a restaurant recently and it reminded me of how much I love those flavors together. This looks fantastic! I love the colors. Nice to see you back here! 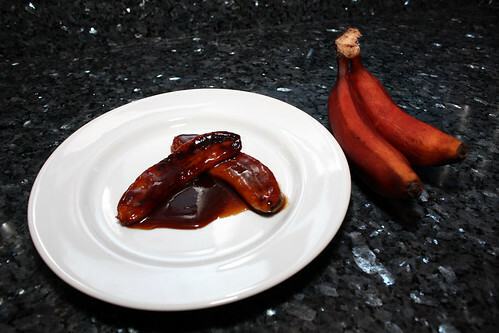 I’ve never had caramelized bananas before, but I can imagine how delicious they must be with the rum! interesting…just bump by to your blog…and the sucre art post are well written…little question..how do u make the water splashing effect with sugar on the showpiece with dolphin? That’s actually the next thing I’m planning to demonstrate as far as sugar work goes. It’s been too hot outside to think about standing over a boiling pot of sugar, and I need to find my sheet of “super parchment”, but I hope to get a post up about it in the next few weeks.